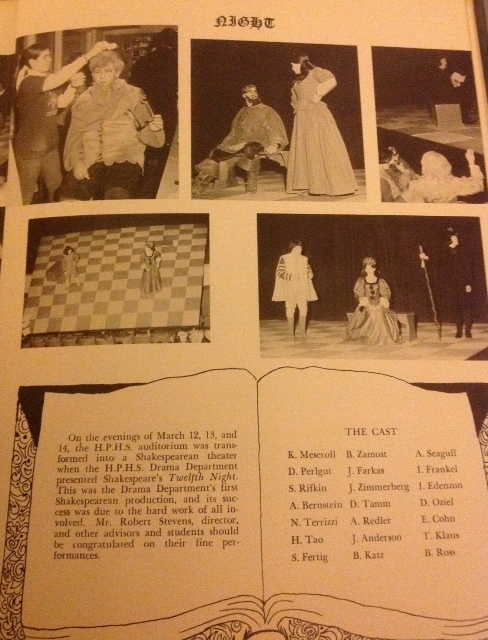 About one month after I turned 18, as a senior in high school in New Jersey, I acted in the role of Sebastian in Shakespeare’s Twelfth Night. Our play director was Robert (Bob) Stevens, the school’s drama teacher, a man who made a profound impact on the professional and creative lives of a number of generations of my high school’s students. He was a former southerner, from Virginia, and that spring production of Twelfth Night was the school’s first attempt at Shakespeare. It was a great success, at least I remember it so. But what did I know – I was 18 and thought that I had the lead role. I didn’t, of course. You hardly see Sebastian in the play. But my experience was akin to that of Tom Stoppard’s lead characters in Rosencrantz and Guildenstern are Dead: they may be off-stage for most of Hamlet, but they are convinced that the story is really about them. For days after I saw “Twelfth Night,” questions about the play and about Shakespeare reverberated in my mind. (Despite my love of mystery, I am, like most humans, a problem-solving animal.) How did he do it? How did he construct such a popular work out of “outsider” thoughts about gender and cross-dressing? By opening himself up to creative empathy, certainly. Where most of us succumb to the limiting power of self-preservation, Shakespeare rushed toward the enormous freedom that can come with “why”—the spirit of inquiry that jump-starts the imagination. I was swept up with the glorious words of the play (once I could understand the words, they were delightful), but only vaguely aware of the radical gender-bending and cross-dressing elements in it. The innocence of youth. And Bob Stevens was nothing if not a brave man when it came to drama. 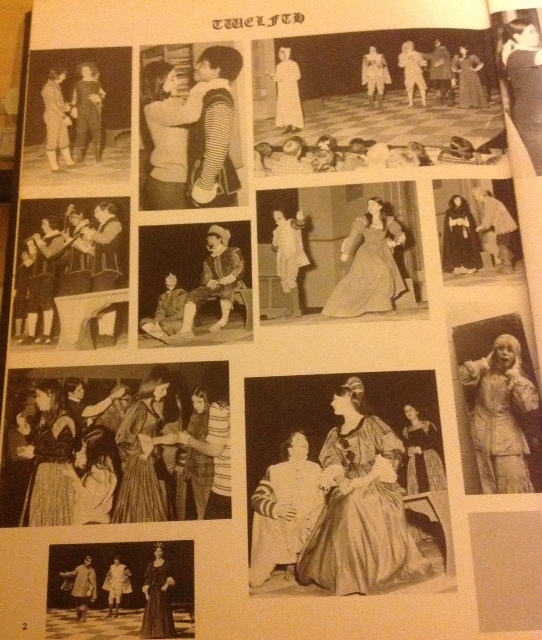 By my count, no less than five of those who acted in the play with me later went on to professional acting careers. An unusually large number? Perhaps, or not. Yet ’tis not madness. Where’s Antonio, then? That is deceiveable. But here the lady comes. Want to see the full script of Twelfth Night: click here for an MIT-supplied version, part of their complete works of Shakespeare free online. This review appeared in the June 25, 2009 edition of the Australian Jewish News. The Australian cinema release of Michael Radford’s version of The Merchant of Venice sets a new modern record for the delay in a film reaching Australian shores: it was originally released in the USA in late December 2004. You read that right – 2004, five and a half years ago. Some might recall that 2004 was not a particularly enlightened year for Jewish representation in mainstream film. It was the year of Mel Gibson’s highly popular The Passion of the Christ, a film which was roundly criticised and became highly controversial for its antisemitic elements, including a pre-Vatican II approach to Catholic teachings on the Jewish responsibility for the death of Jesus. Aside from the death of Jesus (which Gibson’s film showed in breathtaking and sickening goriness), few stories contain such potential for antisemitism as William Shakespeare’s play The Merchant of Venice, in which Jewish money-lender Shylock (played here by Al Pacino) insists on extracting his literal “pound of flesh” from Venetian merchant Antonio (Jeremy Irons) who does not repay a loan on time. The play has a long history of being used for antisemitic purposes, notoriously by the Nazis after they took power. Thus this film version – reportedly only the second “big screen” adaptation since a musical made in 1932 starring Bing Crosby (the latest screen version to reach Australia was by the BBC in 1980) – is certainly a subject of great interest. As a play, it is an odd hybrid, both a romantic comedy (including Shakespeare’s favourite mistaken identities) and tragic drama of prejudice and revenge. The history of and controversy over the portrayal of Shylock is extensive, and the debates still rage on. He is one of the most recognised Jewish caricatures in dramatic history, possibly exceeding Charles Dickens’ Fagin from Oliver Twist. His fate in the play (spoiler alert: don’t read on if you don’t want to know the ending) is tragic: he not only loses his only daughter Jessica (played by Zuleikha Robinson), but is later humiliated and forced to convert to Christianity. Notably, Shakespeare gave Shylock certain redeeming qualities, particularly his famous “Hath not a Jew eyes ….” speech, and almost all modern staged versions of the play show him in a reasonably sympathetic light. Radford introduces the play in an unusual way. Prior to the first spoken lines, he shows scenes of Venice (most of them beautifully filmed on location) with titles on screen explaining how the 16th century Jews of Venice were discriminated against and marginalised from society, forced into occupations such as money-lending. He tries very hard to set a social, political and historical context for the story, which has rarely been done – and which many commentators have complimented him on. The production is outstanding, with great scenery and luscious costumes. Radford’s deft editing (at more than two hours, he still dropped some scenes) and the outstanding cast (which also includes Joseph Fiennes – brother of Ralph – as Bassanio in one of his best performances to date) make this a strong and engaging piece of cinema. He neatly incorporates subtext, suggesting a strong homosexual attraction between Antonio and Bassanio. But it is Pacino’s strong performance as Shylock that grounds the play. Pacino can be tough (he has been called “scene chewing”), and it is his creased, bearded and anguished face that you remember long after viewing this film. Radford’s positive efforts notwithstanding, as Hamlet says – “the play’s the thing”. And no matter how well-intentioned the production (and this one genuinely is), the basic story of The Merchant of Venice is deeply problematic. Even with the most sympathetic interpretation, the Jews fare very badly in this story and the Christians all live happily ever after.